With the recent success of Black Panther, it has become quite clear that it is going to be one of the biggest movies of 2018. If you’re looking for similar movies which will follow suit, you come to just the right place cause below is the compiled list of those which I think are going to be the most anticipated and biggest movies of 2018. When Sony reverted the rights to Spider-Man back to Marvel, many thought the Venom movie will probably be canceled cause well, a movie about a spiderman villain without spiderman is just… a bad idea. However, when it was announced that Tom Hardy would play the titular character, everyone immediately changed their mind. Having played Bane in The Dark Knight Rises, a lot of people can see he’s clearly fit for the role. And with other acclaimed actors and actresses slowly joining him including Michelle Williams and Woody Harrelson with Zombieland director coming behind the camera, Sony might have one of this year’s best film up their sleeves. If you didn’t realize it, the mission impossible franchise has been here for over 20 years. Now Tom Cruise is back as IMF(Impossible Mission Force) agent Ethan Hunt and with this installment, it looks like it’s going to be more personal than before. Christopher McQuarrie also returns after directing Rogue Nation and there’ll be a lot more familiar from the franchise. Unfortunately, Jeremy Renner won’t be returning due to his Marvel obligations but nonetheless, it looks like it’s still going to be a big hit just like the previous movies. A sequel to the 2016 Fantastic Beasts film, the first to win an Oscar in the Wizarding World franchise, the Crimes of Grindelwald follows his escape from MACUSA after he was captured at the end of the previous film and will see a young Albus Dumbledore and Newt Scamander try to stop him. Most of the original cast from the first film will be returning and we’ll get to see more throwbacks into the Harry Potter series including Hogwarts and of course a young Dumbledore played by Jude Law. This is the 2nd out of 5 films in the Fantastic Beasts series and as long as J.K Rowling remains as writer, these films will continue to bring us deeper into the spectacular Wizarding World. The 3rd Marvel movie to be released this year, Ant-Man and The Wasp is released shortly after Infinity War but happens before it. It follows after the events of Civil War and Scott Lang returns as Ant-Man, and must reunite with an old ally who now holds the mantle of The Wasp to face an unknown threat. Every film in the Marvel Cinematic Universe upon release has always conquered the number 1 spot at the box office and there’s no reason this won’t too. The first Ant-Man may have performed a bit below Disney’s expectations but with this sequel will have the added bonus of being released after Infinity War which will reel audiences back after seeing the both of them fresh in that film. The long awaited sequel that took over a decade to convince Pixar that it is a necessity, it is finally time to see our favorite animated superheroes once again on the big screen. The first Incredibles is without a doubt one of the greatest animated films of the 2000s managing to earn itself 2 Oscars in its wake. The sequel will take place immediately where the first film left off and the majority of the beloved cast are set to return. The only sequel Pixar managed to screw up was Cars 2 and with their last sequel Finding Dory being a critical and financial success, it is most likely Incredibles 2 will follow suit and perhaps perform even better. The Solo spin-off film has not been heavily marketed until very recently after having gone through a lot of trouble in production especially the changing of directors again and again. However, it still being part of the Star Wars franchise is why it’ll still be a huge success. Their recent films have all grossed over a billion dollars worldwide and Solo has a great chance of doing so too. With the fact that it concentrates on the past of one of the original and most beloved characters before A New Hope, this is an advantage that Rogue One never had and might propel the film to perform even better. Joining rookie Alden Ehrenreich is Woody Harrelson, Donald Glover aka Childish Gambino and Game of Thrones’s Emilia Clarke. Let us all hope that all the trouble it went through during production will not affect the final product that much. The first movie on this list to be released this year, Black Panther has somehow generated a huge amount of hype weeks before its release. The last film in the MCU(Marvel Cinematic Universe) to be released before Infinity War, fans are hoping that it’ll answer questions and give away hints of what is going to happen during Infinity War. Rotten Tomatoes have given it a 100% upon its release and it has already broken tons of box office records while it’s domestic gross has already beaten the entire domestic gross of Justice League. Also receiving universal acclaim from critics and audiences alike, Black Panther has somehow exceeded all expectations Disney had initially and is clearly one of this year’s must-see. If you haven’t seen the first Deadpool movie, you must be living under a stone. It broke box office records upon its release and became the highest R-rated film of all time. It even managed to garner 2 Golden Globe nominations. Now, Ryan Reynolds is back as Deadpool in the sequel and this time it looks bigger and better than the first. Josh Brolin joins the majority of the returning cast as Cable, a time-traveling mutant and will join them on their new adventure. From the trailer, chances are that this sequel will be just as good as the first… or even better. The Jurassic franchise returns with The Fallen Kingdom, the awaited sequel to Jurassic World and the 2nd movie of the new planned trilogy. The original Jurassic Park was at one time, the highest grossing movie of all time back in 1993 and Jurassic World was the 3rd highest grossing movie of all time after its release. The Fallen Kingdom is unlikely to follow suit as sequels don’t usually fare as well as its predecessor but that doesn’t mean it’s not going to still be a huge box office success. In The Fallen Kingdom, Claire Dearing recruits Owen Grady to help save the dinosaurs from the island of Isla Nubar after a volcano eruption threatens to drive them to extinction. Jeff Goldblum returns as Dr. Ian Malcolm from the original Jurassic Park and this addition will probably make fans of the original film interested again. If you didn’t see this film coming, then you probably have been living under a rock. The culmination of Marvel movies for the past decade starting from the very first Iron Man film has resulted in this. A film where it’ll reunite the original Avengers, the Guardians of the Galaxy and other heroes that came along the way such as Ant-Man and Doctor Strange. Thanos, who has been teased from the first post-credits scene in the first Avengers movie is finally here as the main villain of the film and oh boy, he looks like he’s going to be a major problem for our heroes. It is very much certain now that not all our heroes will make it through this but do not fret, Infinity War is the first part of the final Avengers film with the second part planned on release the following war. With the amount of hype it has produced, it is very likely that it’ll be the 4th film to gross over $2 billion worldwide. 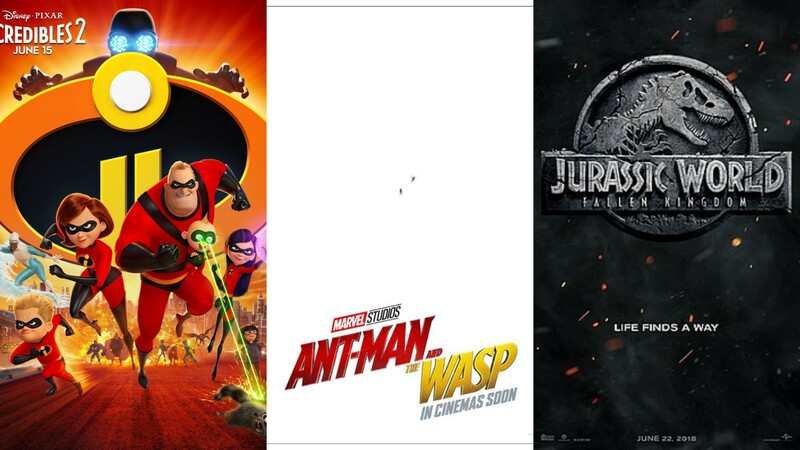 With Avengers: Infinity War slowly coming our way after they brought the release date forward to April, we must not forget the other great films that are coming inbound. Get your pockets filled cause it’s gonna be the best year for films yet!